Keeping up with the recent themes here at My 1-2-3 Cents (October was Halloween, November was Survivor Series and Chikara Pro), I'm going to attempt to do 25 days of Christmas Wish lists blogs. I got the idea for this from Chad after having a horrible case of writers block. So each day I'll look at a wrestler and analyze what it is I think he or she wants for Christmas. Of course by the time the holiday rolls around, some of these stars may have had their wishes granted. So first up, is everyone's favorite broski, Zack Ryder. I think it's pretty clear what he wants this year. A shot at the U.S. title. I don't think many people can argue against it. Ryder has pinned the champ, Dolph Zigger on at least two occasions, I think one was a non title match and the other was a tag team match. Zack also picked up a big win over former World heavyweight champion Jack Swagger. BUT, does that mean the Long Island native is ready for a run as champ? This may disappoint some, and this is coming from a former Broski of the Week (episode 22), but I think the WWE kinda screwed up their push of Ryder. Here's why. For months we didn't see him at all on Raw or SmackDown!, only random times on Superstars. That's fine, but how many people watch Superstars? I think more people watch Z! True Long Island than Superstars, but that's another issue. I don't think he's going to beat Dolph for the title. I would almost bet that they'll face off at TLC in some kind of match and Ziggler will get the victory. I do have high hopes for both these guys though. I'll get into more specifics in a future blog. 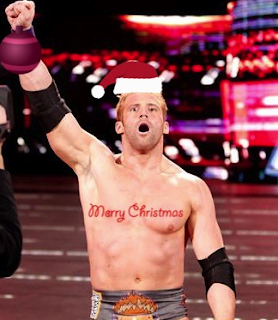 But please don't misunderstand, I think Zack Ryder is great. He's one of the guys who will be the future of the biz, I just don't like the way the WWE has gone about pushing him so far. Leave your comments here, good or bad, I can take it. And please like us on Facebook, follow us on Twitter, and buy the My 1-2-3 Cents t-shirt, oops, I mean, subscribe to the YouTube channel!